Does any film director love the U.S. Cavalry more than John Ford? Better yet, does anyone in this country’s history adore the cavalry more than him? When the brave men climb aboard their horses and ride fiercely into battle, you get the sense that Ford would do anything to join them. In his book Five Came Back, Mark Harris documents the classic American director’s interest in establishing his credentials as a courageous warrior. Ford’s tall tales about being inside the battle resemble those about legendary heroes whose names are championed in song lyrics. He may have shot the famous “print the legend”scene in The Man Who Shot Liberty Valance, but that doesn’t mean Ford dislikes the heroes. They rode into the camps of their enemies and stood bravely while arrows landed at their feet. Who wouldn’t want to be the type of man that can face that type of danger? When the trumpets blare and death is in the air, Ford revels in showing the guys who understand the risk yet realize it’s necessary to resolve the conflict. Despite this patriotic attitude, Ford shouldn’t be confused with a naïve filmmaker who doesn’t recognize the flip side. The first film in his cavalry trilogy, Fort Apache, shows the problems when this bravery turns into obsession. It’s one thing to defend against Native American invaders; it’s another to seek out conflict. The tragic finale shows the disastrous results of that fervor and the government’s willingness to push it under the rug. Henry Fonda’s Owen Thursday is a fictional variation of George Custer and endures a similar fate. This makes the direct reference to Custer at the start of She Wore a Yellow Ribbon an interesting choice. 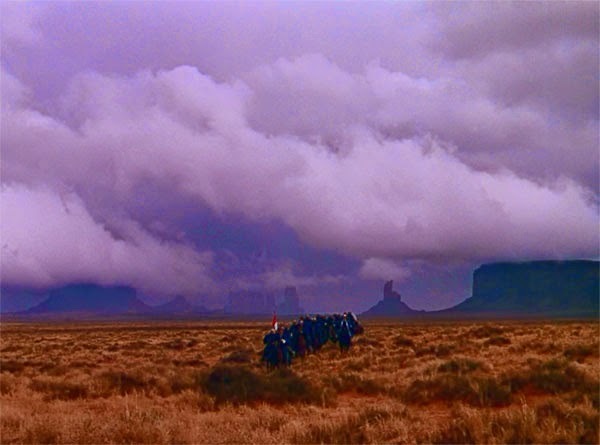 His failure at Little Big Horn connects directly to the environment that faces Captain Nathan Brittles (John Wayne) at the start of this story. The 60-year-old veteran is days from his retirement but has no plans to fade slowly into oblivion. Brittles has been assigned one last mission — providing safe passage for two women to the stagecoach. This seems easy, but the danger from a new group of Native American warriors is very real. It will take all of Brittles’ guile to keep them safe, and success is no guarantee. Ford presents their enemies in one-dimensional terms, which is disappointing given the depth of Fort Apache. The narrator describes their reasons for the attacks as protecting their hunting lands, which is simplified. While we can only expect so much in 1949, there’s something unsettling about the way the enemy is depicted. They’ve been armed by American gun runners, and the way they dispose of them shows a cruelty that goes beyond protecting their livelihood. The men are repeatedly tossed in the fire as sport while Brittles and his guys observe their deaths. Their casual reaction presents men who have been hardened by the loss of people they know and are hardly innocent in this fray. It’s impossible to understate the beauty of Monument Valley and other Utah locales that provide the backdrop for this story. Cinematographer Winton Hoch (The Quiet Man) won a well-deserved Oscar and presents long shots that reveal a grand scale rarely seen on the screen. The characters are minute parts of the screen and dwarfed by the massive landscape. It makes the story feel so much bigger, even when they’re just riding casually down the trail. When the action picks up, the scale creates a different environment than the typical Western. The quest for survival is more about the entire group than any particular individual. Ford is showing how the future of the cavalry and maybe the entire civilization is at stake. Following Custer’s failure, will the forces of the wild take over this land? 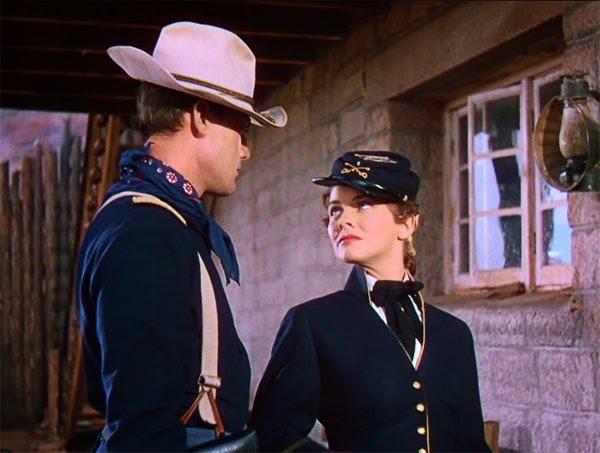 The screenplay from Frank Nugent and Laurence Stallings spends a lot of time on the love triangle between Olivia Dandridge (Joanne Dru), Lt. Cohill (John Agar), and 2nd Lt. Pennell (Harry Carey Jr.). The challenge is that neither guy is particularly memorable. It's also obvious that Cohill is the choice, and his angry rebukes of Dandridge mask the love in his heart. The saving grace of these scenes is the fine work from Dru, who had similar success with her character in Red River. Her most interesting connection is with Brittles, however. Wayne and Dru have great chemistry, though it's a fatherly relationship. It's possible that Dandridge reminds Brittles of his dead wife from his younger days. Their bond carries a lot more weight than the scuffles between the two young guys over her affections. 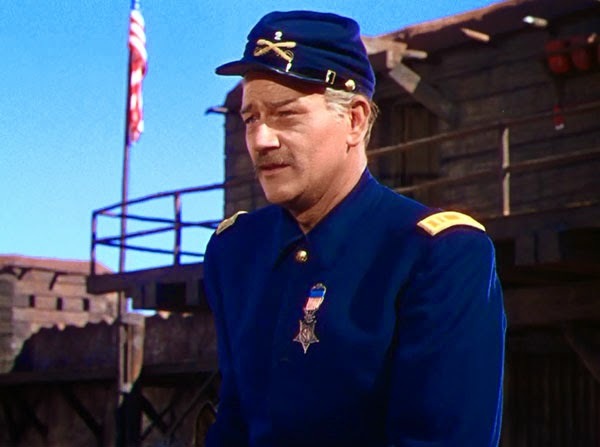 I've yet to mention one of She Wore a Yellow Ribbon's strongest elements, which is the soulful performance from John Wayne. Playing a man several decades beyond his real age, he brings fascinating depth and weariness to the role. His last morning with the troops after receiving his walking papers is one of the best moments that I've seen from Wayne's career. The mix of frustration and graciousness is hard to play convincingly, and he never strikes a false note. We understand Brittles and his realization that nothing in his life will match his experiences with the cavalry. He's determined to complete this final mission and refuses to fade into obscurity. This melancholy tone is the key factor that allows this story to overcome its limitations and deliver an emotional impact. Ford and Wayne create a convincing portrayal of a noble guy whose entire life is devoted to a single pursuit. This fully realized character lifts this modest story to much greater heights. 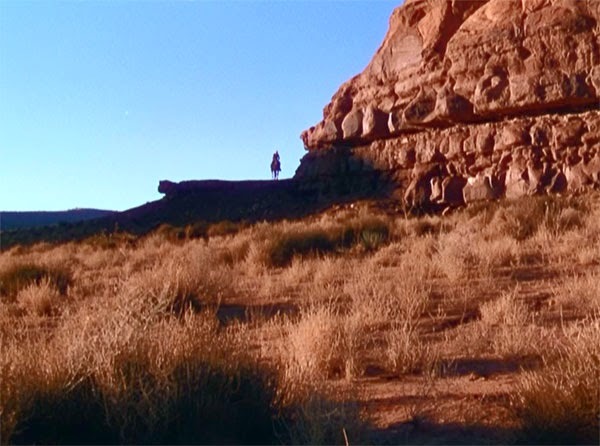 Note: This piece is a contribution to the John Ford Blogathon hosted by Krell Laboratories. A group of talented writers have delivered great pieces on every corner of Ford's career. Nathan Brittles is one of Wayne's most memorable characters and set in a movie that makes him truly unforgettable. As always, there are interesting people in the background like Mildred Natwick and George O'Brien. Mildred Natwick is a great character; I meant to discuss her in my piece. I'm also a big fan of Victor McLaglen as Quincannon. He's in all the cavalry films (though a different character in Fort Apache) and brings some levity to the movie. I definitely agree with you re: John Wayne's "soulful performance" – which is an excellent way of putting it. I'm glad that my review helped you to give it another chance. I wouldn't call this one of my favorite Ford films, but there are certain moments and performances that stand out. Thanks for stopping by!